How is it already Friday again?? Not that I'm complaining! It's time for the Book Blogger Hop again! The Hope is hosted by Jen over at Crazy-For-Books. For information on how to participate, please visit the link! I don't know if it's an Aussie thing, but I call them lollies?? I don't have a big sweet tooth though, I prefer savoury goodies myself! But if I'm in the mood for something sweet I would have to say Starburst! They are so tasty. I like all the flavours except lemon and orange so usually they will be left at the end of the packet not eaten! I'm not to familiar with many super heroes, so I don't really know enough about them to pick an alter-ego! 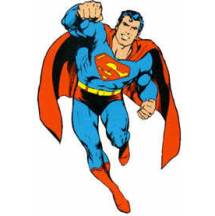 However, since I couldn't decide, I took a superhero quiz, and my result was Superman! What about you? What is your superhero alter-ego and what is your favourite lolly? Leave links to your Friday posts and I will check them out! Just going through the FF posts. Always looking forward to see what people think. New follower. Come visit me over at Livre De Amour-Books of Love Blog. Hum, I think I would have to sour apple lollipop. Hopping through. I always skip the orange and yellow Starburst too. The red ones are the best. This was a very tough question. Thanks for the follow. I followed you back. Have a great weekend. From Aussie to Aussie I must say that you are right and Starburst are the best! Although I like the red/pink ones. (My Hop post says why). Currently doing the Hop! and hopping around and found yours :) This is my first Hop! so hopefully I'm doing it right!